Fagor is one of the market leaders when it comes to pressure cookers. They are sold online at Amazon as well as many other leading retailers across the nation. Today, we will be taking a closer look at Fagor pressure cookers and uncover the reason as to why they continue to corner the pressure cooker market. Fagor Duo 8-Quart $100-$125 4.7 Read Our Fagor Duo 8-Quart Review..
Fagor Duo Combi 5-Piece Set $115-$165 4.6 Read Our Fagor Duo Combi 5-Piece Set Review.. The Fagor Duo 8-Quart Stainless-Steel Pressure Cooker offers a unique design with multiple features that make cooking a quick, healthy meal easy. It all starts with the pressure cooker’s sleek design. This particular pressure cooker is made to be used on all heat sources instead of being plugged into the wall. Because of this, it more closely resembles a stainless steel pot, providing the cooker with a sleek look. It is constructed out of 18/10 stainless steel, which offers long-lasting durability and a high-quality, professional appearance. An impact-bonded diffuser base allows for even heat distribution. The one thing that gives the pressure cooker away is its handle, which stays cool and locks securely in place. It contains a triple safety feature with a dual pressure control valve and two independent pressure release valves. It also contains a visual pressure indicator, so you know exactly when the pressure has been released, and it’s safe to open the cooker. The handle is UL approved. Not only does the Fagor Duo 8-Quart Stainless-Steel Pressure Cooker make cooking healthy meals easy, but it also makes serving them up easy as well. It comes with a handy stainless steel steamer basket with convenient legs and a handle, which also makes draining pasta or steaming vegetables a breeze. The pressure cooker can reduce cooking time by 70 percent, which also means saving 70 percent on the energy needed to cook the meal if you were to use traditional methods. Two pressure settings are available, and this particular model comes with instructions, as well as recipes. Because the Fagor Duo pressure cooker works on the stove and other heat sources, instead of needing to be plugged into the wall, it is dishwasher safe. This particular model is quite affordable (see lowest price). However, smaller and larger models than the 8-quart size are available, depending on your needs and your budget. Unfortunately, it’s all too easy to swing through the drive-thru on your way home when you know you don’t have a lot of time or energy to cook. For some, the hassle of dealing with a clunky electric pressure cooker is too much to take, especially when cleaning up isn’t easy. The Fagor Duo 8-Quart Stainless-Steel Pressure Cooker with Steamer Basket simplifies pressure cooking with a streamlined, stainless steel design that is dishwasher safe. You won’t mind cooking with it in the evening, no matter how tired you are, because it’s so simple! When I say that this pressure cooker can cook food fast, I really mean it. Cook a delicious risotto in just 7 minutes, meatballs in just 4 minutes, and chicken soup in 15 minutes. You can even enjoy cheesecake in 30 minutes! If you’ve ever made homemade cheesecake before, you know it can take hours before you’re able to enjoy the fruits of your labor. The Fagor Duo Pressure Cooker can cook food up to 70 percent faster than traditional cooking methods. If you’ve never cooked with a pressure cooker before, I definitely recommend that you start with a recipe from the cookbook. There are a lot of tasty dishes to try. Another great thing about this particular pressure cooker is that it comes with a 10-year warranty. It has even appeared on MasterChef and was voted Best Buy in Leading Culinary Magazine, so you know it must be good! It is extremely important to understand that this isn’t a set-it and leave-it pressure cooker. It is made to work on all domestic cooking surfaces which include gas, electric, ceramic, and induction, which means you have to be present while cooking. If you’re looking for a pressure cooker that skips all the fancy settings, the Fagor Duo 8-Quart Stainless-Steel Pressure Cooker could be for you. 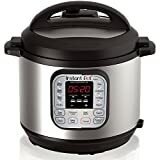 Its streamlined design fits right in with all the other pots and pans in the kitchen and having only two settings; there’s no need to stress over the endless settings that are standard with other pressure cookers. It’s also a great choice because it can be placed in the dishwasher safely. You don't have to spend time scrubbing away at hard to clean food spots. Simply rinse it out, throw it in the dishwasher, and your job is done. Designed for use on all heat sources, the Fagor Duo 8-Quart Stainless-Steel Pressure Cooker is approximately 17-1/5 by 11 by 10 inches and comes with a 10-year warranty. 4 and 8 Quart Pressure Cookers. Sometimes, you’ll be cooking for one. Other times, you’ll be cooking for a crowd. Either way, the differently sized pressure cookers ensure that you’re ready! There is also a stainless steel pasta/steamer insert included that works with both pots! Stainless Steel Construction. Each of the five pieces in this set is crafted from high-quality stainless steel. Using stainless steel makes them dishwasher safe, resistant to rust, and resilient to bacteria. Triple Safety Mechanism. If you’re accident prone like me, then you’ll love Fagor’s patented triple safety mechanism. The mechanism features two independent over pressure release valves and a dual pressure control valve. The valves allow excess pressure to escape, so I can rest assured that each of my dishes will come out perfectly! The duo cooker set is designed to save up to 70% of the energy and time that traditional cooking methods require. It can be used to cook vegetables, rice, and meat. The patented design of the pressure cooker lid fits both the 4 qt. and the 8 qt. pans. When used with the lid, the 4 qt. cooker can serve double duty as a saucepan, and the 8 qt. cooker is designed to hold the steamer basket insert, which can be used for steaming vegetables or draining pasta. The Fagor pressure cooker is a great bargain (see lowest price), especially since you are essentially getting two pressure cookers for the price of one. What’s particularly great these pressure cookers are that they were designed with safety and simplicity in mind. The handles of the pressure cooker and the pots are constructed from heat resistant black plastic, so you don’t have to worry about burning your hands should you forget to put an oven mitt on. The shared lid is made from tempered glass, which is quite durable. It can survive being accidentally knocked off the counter or dropped in the floor without suffering any damage. Other notable safety features include a safety lock handle, visual pressure indicator, and an automatic pressure release valve that makes sure the lid won’t accidentally come off. One of the Fagor Duo’s best features: All of its components (except the pressure lid) are 100% dishwasher safe. If you’re like most people, the last thing you feel like doing late at night is the dishes, so it’s great to just toss the pots into the dishwasher and forget about them. So, what it is about this particular pressure cooker that sets it apart from its competition? The answer is the manufacturer – Fagor. Headquartered in Spain, Fagor creates high quality, energy efficient appliances for the modern chef. In Europe, Fagor has acquired multiple environmental stewardship awards, and in the U.S., they’re an active member of the government’s Energy Star program. Superior quality and environmentally conscious construction sound like a winning combination. I have a full-time career. I also happen to have three kids and a husband who eat me out of house and home. If you’re like me, by the time you get through getting off work, picking up the kids, and rushing them around to their various activities, the last thing you feel like doing when you get home is cooking. For far too long, my family’s diet consisted primarily of takeout. When my husband and I decided to recommit ourselves to following a healthier lifestyle, my best friend bought me the Fagor Duo Combi cooker set as an encouragement present, and this is one of the main reasons why she is my best friend! This pressure cooker has streamlined my life and makes each day flow smoothly. Our family preps our lunches for the week on Sundays, and I have run this cooker continuously for up to 12 hours straight with no issues. Thanks to its safety features, I can leave it unattended while it does the cooking, and I don’t have to worry about small hands accidentally burning themselves on the handles. One feature I really like about this pressure cooker is its encapsulated bottom, which is designed to ensure even heat distribution. I never have to worry about my meat being unevenly cooked, and the automatic pressure release releases any excess steam to ensure that each dish is cooked to perfection every time I use it. Not only does it cook quickly, but it uses 70% less energy than its nearest competitor. Not only do the dishes I cook in it taste great, but I also feel so much better about myself knowing that I’m serving my family a nutritious meal. If you want to lead a healthier lifestyle, but constantly find yourself short on time, this cooker set is a great tool to get you started on the right track. It makes it so much easier to stick to your goals. When you come home at the end of the day, you’ll feel so much better knowing that a warm meal is waiting for you. I can’t think of anything better. For energy efficient appliances that have great safety features and functionality and that are easy to use and clean, then Fagor pressure cookers should be at the top of your list. They are compatible with a variety of different cooktop surfaces and offer quick and versatile results that you won't find with other small kitchen appliances. You can create delicious meals in a fraction of the time with even heat distribution. My name is Elizabeth Nitz and I love pressure cooking...but you have probably already figured that out :) I started this website to help people like myself increase their knowledge and passion about pressure cooking. I would LOVE to hear from you - please contact me! Copyright 2019 Pressure Cooker Pros. Pressurecookerpros.com is a participant in the Amazon Services LLC Associates Program, an affiliate advertising program designed to provide a means for sites to earn advertising fees by advertising and linking to Amazon.com.